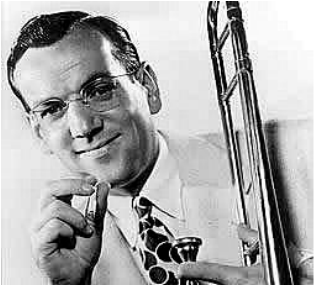 GLENN MILLER, HIS TROMBONE & HIS CHESTERFIELD. No music is more closely identified with the World War II years than that of Glenn Miller’s orchestra. Miller’s records for RCA’s low-cost Bluebird label accounted for 70 Top Ten hits from 1939 until he disbanded his band in September, 1942, to join the Army Air Force. Much of Miller’s wild popularity can be credited to radio, beginning with late night remotes in 1938 and climaxed with two separate series plus remotes running on four different networks in 1941-42. He found steady work with Ben Pollack’s popular touring band in 1927. Still only 23, Miller realized his limitations as a musician and determined that his future lay in composing and arranging. He left Pollack in New York a year later and married his college sweetheart, Helen Burger, while building a reputation in the city’s music ranks as a dependable freelance sideman and talented composer, publishing his 125 Jazz Breaks For Trombone in 1928. Miller developed his signature sound - a lead clarinet over four saxophones with brass punctuations - in arrangements for British bandleader Ray Noble who came to America in 1935. Miller organized an orchestra for Noble and joined it as a sideman along with future stars Claude Thornhill and Charlie Spivak. (2) But Miller set the unique style aside when forming his own band in 1937. The group recorded several sides for Brunswick then failed on the road and disbanded in early January, 1938. Opening at Shribman’s Roseland-State Ballroom in Boston in August, 1938, the dates also involved late night CBS remotes on Tuesdays and Saturdays which gave the band its first steady Network Radio exposure - good advertising for its first two sides recorded for RCA Bluebird in September, My Reverie and King Porter Stomp. The Paradise was far from it for the band which was required to play for two shows - a second rate comic and a chorus line of “The World's Most Beautiful Girls” - plus their own sets for dancing every night. It was exhausting work but Miller pushed them hard, waiting for the big break he hoped would come from its weeks at the Paradise. It finally did. Former Metronome editor George Simon reports in his text Glenn Miller & His Orchestra, the grueling Paradise dates led to steady bookings at the popular Meadowbrook Ballroom and Glen Island Casino on the outskirts of New York City throughout 1939 and a regular schedule of remote broadcasts on NBC pushing its Bluebird records. The band was suddenly a hot property with a string of eleven Billboard Top Ten Hits in 1939, including Moonlight Serenade, Little Brown Jug, In The Mood, Stairway To The Stars, Moon Love, Sunrise Serenade, Wishing Will Make It So and Over The Rainbow. Compare the tepid Paradise reception with the cheers the band received ten months later at the ASCAP Gala in Carnegie Hall on October 6, 1939. Miller is introduced by ASCAP President Gene Buck - after performances by the already established and famous bands of Paul Whiteman, Fred Waring and Benny Goodman. The mini-concert that follows is quintessential Glenn Miller of the 1930’s, punctuated by Maurice Purtill’s drum solo that climaxes its concluding number, Bugle Call Rag - an obvious response to critics who wrote the band off as just another play-it-by-the-charts commercial group. But Miller knew that commercial packed ballrooms, sold records and paid the bills. (5) Accordingly, Miller’s return to Frank Dailey’s famous Meadowbrook Ballroom in Cedar Grove, New Jersey, on November 16, 1939, is his typical mix of swing and ballads received with ovations that the band could only dream about in its Paradise days. The first of Miller’s Moonlight Serenade broadcasts for Chesterfield with announcer and future film star Paul Douglas, is posted below. The December 27, 1939, broadcast at 8:30 p.m. is unlike any other in the series - it’s 30 minutes long and showcases the singing Andrews Sisters over Miller’s music. Beginning on January 2, 1940, Moonlight Serenade aka Chesterfield Time became a 15 minute program and aired on CBS every Tuesday, Wednesday and Thursday at 10:00 p.m.
It’s likely that CBS gave Chesterfield a deal to take the timeslot off its hands given its NBC competition which consisted of three Top Ten shows. On Tuesday Miller’s 6.6 season rating was up against Bob Hope’s Number Five ranked rating of 23.1. On Wednesday he was faced with Kay Kyser’s Number Ten ranked Kollege of Musical Knowledge and its 18.0 rating. On Thursday it was Bing Crosby’s Kraft Music Hall - the season’s sixth place show with a 21.1 rating. Nevertheless, a 6.6 rating for Moonlight Serenade translated to over 4.5 million listeners and that’s a lot of smokers. Three of the broadcasts from 1940 are also posted below - April 3rd, June 13th and September 17th. The programs, broadcast from wherever in the country the band was appearing, also pushed Miller’s record sales to new highs. A Bluebird recording session on February 8, 1940, produced one of Miller’s impressive 31 Billboard Top Ten hits for the year, Tuxedo Junction. The list also included The Woodpecker Song, Imagination, Blueberry Hill, Stardust and Pennsylvania 6-5000. Miller’s huge volume of records sold in 1940 didn’t improve his radio ratings. The 1940-41 season showed little improvement for Moonlight Serenade which registered a season-long rating of 6.7 against Bob Hope’s Number Four ranked 26.6 on Tuesday and Kay Kyser’s eleventh ranked 16.6 on Wednesday. NBC moved Bing Crosby back an hour on Thursday and replaced him with Rudy Vallee who generated a 14.4 rating, good for 19th place among all programs. Broadcasters’ boycott of ASCAP music from January through October, 1941, is evident in the Chesterfield show of May 8, 1941. Miller’s familiar theme, Moonlight Serenade, is replaced by Slumber Song, the substitute Miller wrote and registered with BMI. Forgettable BMI compositions I Take To You and A Love Song Hasn’t Been Sung along with the spiritual Swing Low Sweet Chariot deflected ASCAP scrutiny on this show. Miller’s parade of hits continued into 1941 with eleven Top Ten recordings beginning with String of Pearls and included Perfidia, Elmer’s Tune and The Song of The Volga Boatmen. Then 20th Century Fox released Sun Valley Serenade featuring the band in late August. The movie contained the Miller hits At Last, It Happened In Sun Valley, I Know Why and the Harry Warren/Mack Gordon composition, Chattanooga Choo-Choo, which was nominated for an Academy Award and sold a million copies of Miller’s Bluebird recording that was Number One on Billboard‘s charts for nine weeks. The band’s network exposure was extended to Blue on August 30, 1941, when Miller introduced his hour-long Sunset Serenade shows on Saturday afternoons at 5:00 p.m. The non-commercial programs began as broadcasts of the band’s USO matinees at the Hotel Pennsylvania’s Café Rouge, then followed the band to other venues around the country and were made available for shortwave broadcast to Armed Forces overseas. The program moved from Blue to Mutual on January 10, 1942, and remained on the network’s Saturday afternoon schedule until its last broadcast on May 30th. Most of the 1941-42 season was a ratings repeat of the Chesterfield show’s previous years. Miller’s 15 minute Moonlight Serenade averaged a 6.6 at 10:00 against Bob Hope’s huge 30.7 on Tuesday night which was the Number Two show in the nation. Kay Kyser’s 18.4 on Wednesday missed the Annual Top Ten and Thursday’s Rudy Vallee Show moved up to become the 14th most popular show with a 16.9. Moonlight Serenade was finally pulled out of competition with Hope’s ratings giant on Tuesday and switched to a Wednesday, Thursday, Friday schedule on March 3, 1942. Then, when Campbell Soup vacated the far less competitive 7:15 CBS timeslot following Amos & Andy, Liggett & Myers took it for the Chesterfield show beginning on May 12th where it ran on Tuesday, Wednesday and Thursday nights. Miller’s rating in May improved to a 7.1 which translated to approximately 5.2 million listeners. The shows from June 23rd and July 16th were simply business as usual for the successful unit. Low ratings didn’t hamper Miller’s recording successes in 1942 which amounted to eleven more Top Ten hits including American Patrol, Moonlight Cocktail, Sweet Eloise, Jukebox Saturday Night and Serenade In Blue. The biggest hit of all came from the band’s second movie, Orchestra Wives, which was released by 20th Century Fox in early September. Like Chattanooga Choo Choo, I’ve Got A Gal In Kalamazoo,was another Harry Warren/Mack Gordon novelty featuring Tex Beneke and the Modernaires that was nominated for an Academy Award. It was Number One on the Billboard chart for seven weeks. Despite all the success he enjoyed, Miller wanted to serve his country in some capacity during World War II. At 38 he was too old for combat duty and the Navy turned down his proposal to form a musical unit. But the newly formed U.S. Army Air Force saw Miller’s involvement as a high profile morale booster and recruitment tool. He was commissioned a Captain and left civilian life in the fall of 1942. His final Moonlight Serenade from September 24th is posted below. The most successful band of the swing era disbanded three nights later. In December 1942, Miller was transferred from Maxwell Field in Alabama to Yale University in New Haven, Connecticut, where he formed the nucleus of his famed 50 member Air Force band with 24 dance band musicians, 21 string players and five vocalists that played hundreds of performances in Great Britain. But radio listeners hadn’t heard the last of Glenn Miller. I Sustain The Wings was the motto of Army Air Force Training Command and the title of Miller’s weekly half hour show that combined popular music with narratives of Air Force life. The program premiered on CBS at 2:05 p.m. on Saturday, July 17, 1943. It remained on CBS until September 18th when it moved to NBC at 11:30 p.m. ET on Saturday nights - easily the class among late hour’s big band broadcasts. An air-check of I Sustain The Wings from October 16, 1943 is also posted below. I Sustain The Wings outlived its originator and outlasted World War II. Major Glenn Miller was reported missing on a single engine plane flight to France over the English Channel on December 15, 1944, and World War II ended in August, 1945. Yet, I Sustain The Wings continued on with arranger Jerry Gray conducting the Miller’s Air Force orchestra. until its final NBC broadcast on November 17, 1945. The program is a tribute to Glenn Miller that concludes - most fittingly - with Moonlight Serenade. (1) Miller originally wrote Moonlight Serenade as an exercise while studying the Schillinger System of composition based on mathematics. (2) Ray Noble later gained fame as the orchestra leader and foil for Edgar Bergen’s Charlie McCarthy on NBC’s top rated Chase & Sanborn Hour. (3) In return for Shribman’s covering all of Miller’s debts and the new band’s on-going expenses, he received 25% of its profits. (4) As pointed out in our post Big Band Remotes, goofs were common on the informal band remotes - here the announcer introduces Down South Camp Meeting and the band plays the ballad With You On My Mind. (5) During the band’s startup period each musician and vocalist Marion Hutton, (movie star Betty Hutton’s sister), made $50 a week while male singer Ray Eberle was paid $35.